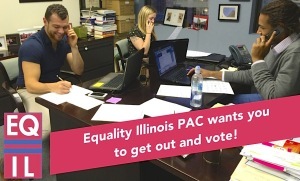 Phone banks in the Equality Illinois offices are working into the night identifying voters and urging them to get to the polls to elect pro-equality candidates. The Equality Illinois Political Action Committee supports candidates from both sides of the aisle who have proven to be champions of LGBT equality. Here is a list of our endorsed candidates. There is still time to vote early at your local jurisdiction. In fact, you can Vote Early this weekend, with some locations even open on Sunday. Voting on Election Day, November 4? Look up your polling location.